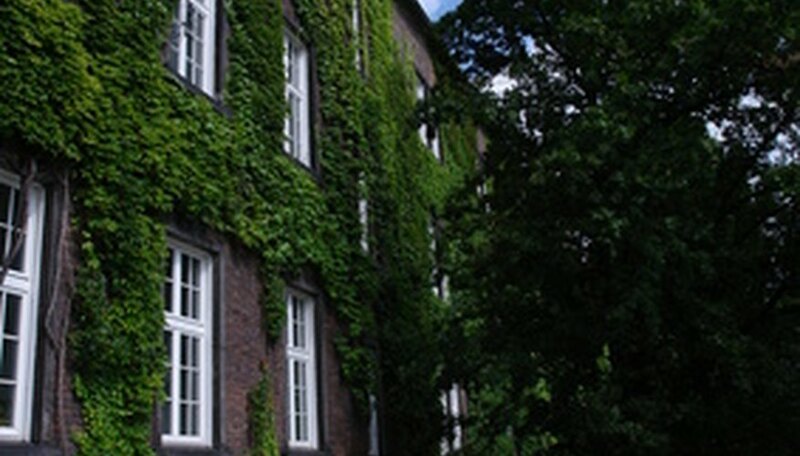 Climbing plants decorate walls, fences, arches and gazebos. They also create attractive groundcovers, vigorously spreading over the soil to provide a novel alternative to lawn grass. While some popular vines such as star jasmine thrive best in full sun, there are several which enjoy shadier conditions. Many climbing plants are perennial, although some are annual, lasting only one year. Evergreen climbers are available, as are deciduous ones. Perennial climbing plants live for multiple years, creating semipermanent fixtures in your yard or garden. Some shade-loving perennial vines include pink honeysuckle (Lonicera hispidula), virgin's bower (Clematis virginiana) and virginia creeper (Parthenocissus quinquefolia). Pink honeysuckle, also known as hairy honeysuckle or California honeysuckle, bears soft, oval green leaves which are shed in colder climates, yet are evergreen in warmer environs. In May and June, clusters of pink, white or purplish, nectar-rich flowers emerge which give way to bright red berries in autumn. Virgin's bower produces fragrant, white blossoms with long stamens which attract the attention of hummingbirds. These flowers give way to hairy white seeds resembling tufts of white string. All parts of this plant are highly toxic. 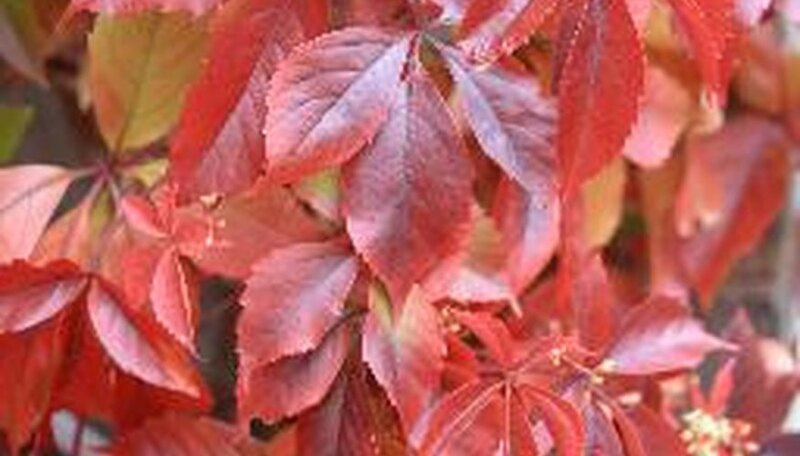 Virginia creeper, hardy in zones 5 to 11, produces large, green compound leaves made up of five leaflets which exhibit warm shades in the fall. In early summer, humble green and white flowers bloom, which give way to clusters of round, poisonous, navy blue berries. Annual shade-loving climbing plants are not as prevalent as their perennial counterparts. One species of climbing annual which thrives in shade is cleavers (Galium aparine). Also known as catchweed bedstraw, this soft plant was once used to stuff mattresses. Distributed throughout the United States, this shade-loving vine grows voraciously in the warmer months of the year, bearing sticky green leaves and stems. Another vine which can grow as an annual is the sweet potato vine (Ipomoea batatas). 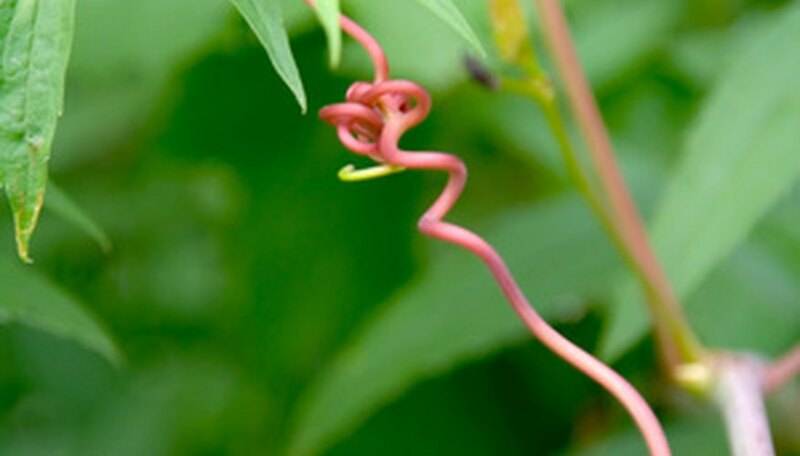 This vine bears showy, near heart-shaped leaves, edible orange tubers and morning glory-like flowers. It is perennial in growing zones 9 to 11, and annual in zones 8 and above. Evergreen vines make attractive ground- and wall covers, as their leaves stay green and lively in all seasons. One popular evergreen climber which thrives in shade is English ivy (Hedera helix). Native to Europe and now naturalized throughout the world, this tenacious climber bears shiny, dark green leaves. It is hardy in zones 5 to 9. Another shade-adoring evergreen vine is the climbing fig (Ficus pumila), a relative of the fig tree. This vine spreads quickly, tolerates a variety of growing conditions and produces small, leathery dark green leaves. It is hardy in zones 8 to 11. Some shade-loving vines shed their leaves in autumn. Such deciduous climbers include Chinese wisteria (Wisteria sinensis) and Japanese honeysuckle (Lonicera japonica). 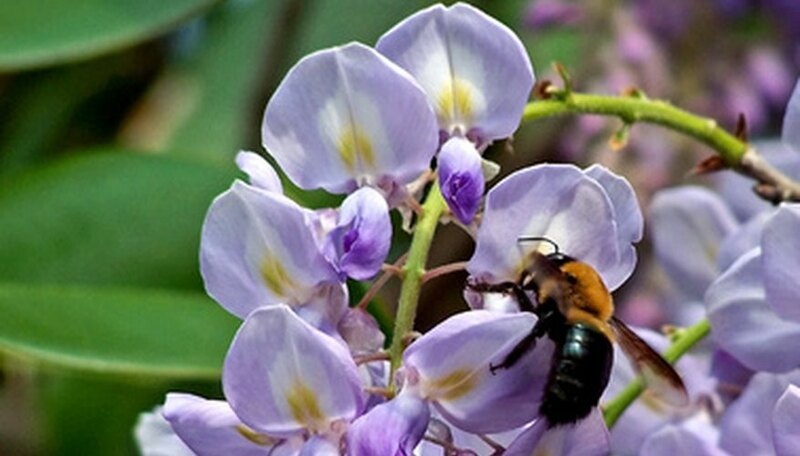 Chinese wisteria is a woody vine known for its fragrant grapelike clusters of purple blossoms, which emerge in early summer. Japanese honeysuckle, which produces showy fall foliage, bears nectar-rich trumpet-shaped blossoms in the warmer months. Both of these deciduous climbers are indigenous to Asia, yet commonly found throughout North America.